This website provides access to the specimens, images and literature of the Sibthorpian Herbarium. This Herbarium is traditionally recognised as the last of the historic herbaria in Oxford University Herbaria. Importantly, it contains all of the plant specimens collected by John Sibthorp (1758-96) on his eastern Mediterranean expeditions which are associated with the Flora Graeca (1806-40). John Sibthorp was the only son of Humphrey Sibthorp (1712-97) and his second wife, the daughter of a rich London merchant. John would eventually receive a substantial inheritance from his mother's estates when she died in 1780. John was educated at Magdalen College School, Oxford, and Lincoln Grammar School. Little is known of John's early life, although it is likely to have been privileged since his father was a wealthy landowner and the second Sherardian Professor of Botany in the University of Oxford. In 1775, John's father purchased a piece of land close to the River Cherwell, opposite the Botanic Garden, and Cowley House was built. It was this that John eventually made his Oxford home. He was educated in medicine at Oxford and Edinburgh, but botany, rather than medicine, became his chief interest, especially following his experiences in Edinburgh. 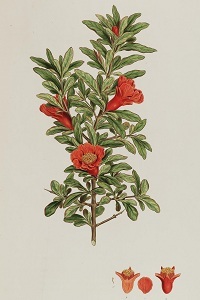 Between 1781 and 1783, Sibthorp went on a European tour and studied botany at the Jardin des Plantes in Paris and at Montpellier University; two of the premier European botanical institutions of the day. At the Jardin du Roi, Sibthorp had the opportunity to study the herbarium specimens Joseph Pitton de Tournefort (1656-1708) collected and the illustrations Claude Aubriet (1665-1742) prepared when they explored the eastern Mediterranean eighty years earlier. It was their expedition that was to be the model for Sibthorp's own journeys through the Ottoman Empire. 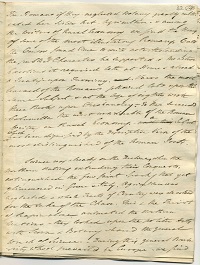 On his return to Oxford in October 1783, Sibthorp received £300 per year (for ten years) from the Radcliffe Travelling Fellowship as a result of his father's lobbying of University authorities. In January 1784 he was made third Sherardian Professor of Botany, having convinced his father to resign his chair. In the late summer of 1784 Sibthorp left Oxford for a journey that would take him through the modern states of the Netherlands, Germany, the Czech Republic, Austria, Slovenia, Italy, Greece, Turkey and Cyprus. He returned to Oxford in 1787 with vast numbers of plant, animal and geological specimens. Sibthorp undertook a second journey to the eastern Mediterranean between 1794 and late-1795. As a consequence of the exertions of this journey he died in 1796 and is buried in Bath Abbey. Following his death, Sibthorp left instructions from the publication of the Flora Graeca Prodromus and the Flora Graeca. With subsidies from Sibthorp's estate the conditions of Sibthorp's will were finally fulfilled in 1840 with the publication of the final fascicle, of the final volume, of the Flora Graeca. 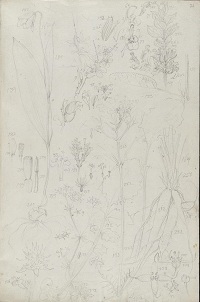 Because of Sibthorp's early death and his dilatory treatment of field data, much of the scientific value of the Flora Graeca rests on the botanical illustrations of Ferdinand Bauer (1760-1826). There are three parts to the Sibthorpian Herbarium: (i) specimens associated with the Flora Graeca (1806-40) and Sibthorp and Smith's Prodromus (1806-16); (ii) miscellaneous specimens; and (iii) specimens associated with Sibthorp's Flora Oxoniensis (1794). Sibthorp's specimens are usually not labelled by himself, and his notebooks rarely give detailed locality information. Locality information used in the database has usually been based on the Prodromus; therefore appropriate caution should be exercised. Furthermore, given the time between collecting the specimens and mounting them, together with the movements the specimens made between Oxford and Norwich, it is hardly surprising that a proportion of the specimens are mounted as mixed collections. There are 2,462 specimens in this part of the herbarium. The collection comprises eudicots, monocots, gymnosperms and ferns, and is arranged according to the Prodromus. Not all entries in the Prodromus have corresponding specimens and not all specimens have corresponding entries in the Prodromus. Specimens are mounted on two different coloured sheets; blue-grey and white-cream paper. The distinction between the two paper types is important. Specimens on blue-grey sheets were mounted by William Baxter (1787-1871) when the specimens were returned to Oxford following completion of the Flora Graeca project. These specimens often have labels in James Edward Smith's (1759-1828) hand, have a printed label indicating that they are from Sibthorp's herbarium and are stamped with references to the Prodromus and Flora Graeca as appropriate. Specimens on white-cream paper were mounted by George Claridge Druce (1850-1932) at the end of the 19th century or beginning of the 20th century; they bear his characteristic hand. None of the specimens are labelled in Sibthorp's hand. This part of the Herbarium includes the specimens purchased by Sibthorp from an apothecary in Zacinthos in 1794. 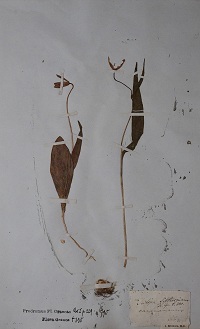 Images of the sheets of this part of the Herbarium were published by IDC (1996). See Lack (1997) for a guide to the use of this part of the Herbarium. There are 444 specimens in this part of the herbarium, and cover all groups from fungi and lichen through marine algae to angiosperms. Specimens are mounted on two different coloured sheets; blue-grey and white-cream paper. The vast majority of the specimens are from Greece, although a significant number of the specimens are labelled as being from Dacia. It is clear that many of these specimens were in the process of being merged with the Flora Graeca specimens by Druce for his aborted attempt to catalogue the collection in detail. The decision has been taken to maintain the Flora Graeca and miscellaneous specimens separate for historical rather than any other reason. Many of the lichen specimens are labelled in Sibthorp's own hand and appear to be mounted in the original collecting packets; none of the other specimens are labelled in Sibthorp's hand. Many of the specimens bear annotations in Druce's characteristic hand. Specimens that appear in the Prodromus but are not found among the Flora Graeca specimens should be searched for in this part of the Herbarium. Lack (2000) made significant discoveries of Syringa vulgaris and Aesculus hippocastanum in this part of the Herbarium. There are 70 specimens in this part of the herbarium, almost all of which are lichens. The specimens are all associated with Sibthorp's Flora Oxoniensis (1794) and appear to have been collected in Oxfordshire. Many of the lichen specimens are labelled in Sibthorp's own hand and appear to be mounted in the original collecting packets. The majority of the specimens are mounted on white paper. Other British Sibthorp specimens are likely to be found in the Sherardian Herbarium and Druce Herbarium. 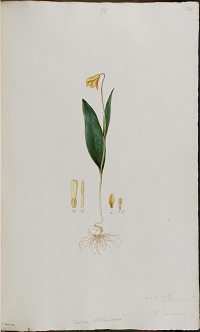 Sources of information related to John Sibthorp, his travels, his herbarium and the Flora Graeca project are available here.